Tunisia’s faltering economy was one of the major contributing factors to the 2011 revolution, and in the years since the revolution it has continued to deteriorate. Closely tied to the eurozone (around 80% of Tunisia’s trade is linked to Europe), the economy keenly felt the effects of the euro crisis from 2008 onwards. Moreover, the high number of university graduates, which number 80,000 per year out of a population of just over 10 million, has exacerbated unemployment. The unstable security situation in Libya, Tunisia’s second economic partner, has added insult to injury. Unemployment is at 15.3%, with that figure even higher among young people and women. Economic growth at the end of 2014 was just 2.4%, almost 4% below what is needed to curb unemployment. Tunisians deeply resent the 5.5% inflation rate, and unfavourably compare commodity prices to their pre-revolution levels. The Tunisian dinar (TND) has lost more than 20% of its value since 2010, with 1 TND now worth around $2, and the country’s international debt has climbed from 40.7% in 2010 to 52.9% in 2014. 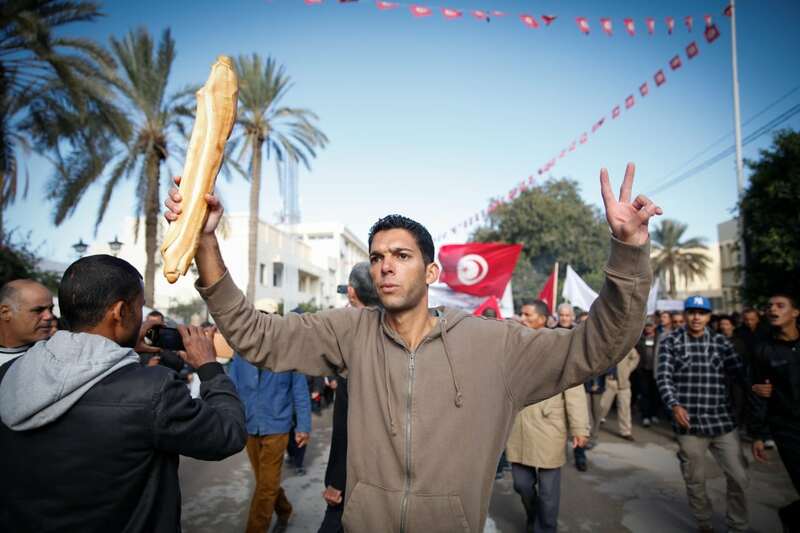 The worsening economic conditions have directly contributed to a growing disillusionment among the Tunisian public with the outcomes of the revolution, despite its political successes, and has led to some yearning for a return to the old regime. All the political parties that ran in the October 2014 parliamentary elections against the winners of 2011 stressed the economy in a bid to seduce voters. The secularist Nidaa Tounes party, for instance, had an electoral banner showing a shopping bag in a popular market with the words “Temporary Dearness”, meaning that commodity prices would go back to their pre-2011 levels if they won. The banner was also a clear political jibe: “Temporary” is the nickname for the troika government of the Ennahda, CPR and Ettakatol parties. Although the plummeting oil prices in 2014 were expected to help shore up the Tunisian economy, rampant corruption in the energy sector and the declining security situation in Libya (Tunisia’s key oil supplier) meant that any benefits were negligible. Drivers filling up at a petrol station still pay more for fuel than they did a year ago. Tourism revenues, which are crucial to the Tunisian economy (6.5% of GDP and around 350,000 jobs), have almost returned to their 2010 levels. Yet European tourists, who were redirected by tour operators to struggling European countries such as Greece and Spain or have avoided Tunisia since the start of the Arab Spring, have largely been replaced by Algerian and Libyan tourists. European tourists are preferred to their Arab counterparts, however, as they enhance Tunisia’s international appeal. They also bring a strong currency (euro) and are willing to buy traditional items, such as chechia headgear and jebba tunics, which are of little interest to most Arab tourists. There is widespread concern that the March 2015 terrorist attack on Tunis’ Bardo Museum, which killed 21 people including 17 tourists, will further hurt foreign tourism. There is also a fear that the declining security situation in Libya will impact disposable incomes in that country, making holidays across the Tunisian border an unaffordable luxury. Coupled with this is the concern that the growing number of Libyan refugees in Tunisia could become a drain on the economy, as their financial resources dwindle but they continue to consume Tunisia’s subsidized goods (bread, oil and so on) and push up real estate prices. People have become less respectful of state authority, seen as a remnant of the dictatorial regime, since the revolution. With waning state bureaucracy in Tunisia and the quasi-collapse of Libya, informal trade across Tunisia’s land borders has expanded considerably. Estimates indicate that informal trade now accounts for around 40% of Tunisia’s economy, depriving the state of significant tax revenues and diminishing its control over foreign currency. This has accelerated Tunisia’s tumble in international credit ratings (Moody’s, Standard & Poor’s) and tarnished its pre-2011 image as “the model pupil of the international institutions”. In the face of this economic decline, the Tunisian government is likely to adopt unpopular measures advocated by the World Bank and the International Monetary Fund. These include cutting subsidies, reducing the number of public-sector jobs and crushing informal trade, and are the sine-qua-non conditions for receiving those institutions’ loans and grants. The USA, one of Tunisia’s main sponsors after the revolution, is also pushing for reforms, particularly of the judicial system, before it agrees to invest in Tunisia. Government officials are reluctant to announce the measures publicly, but rely on allusions and gradual change. This has not stopped the spread of social movements. These are co-opted by UGTT, the leftist trade union which is known for its oppositional stance and broad powerbase. Demonstrations and strikes are legion, affecting the productivity of offices and factories and contributing to the country’s general economic malaise. Local and international investors have threatened to withdraw from Tunisia if the movements continue at their current pace, but their threats have so far been ignored. Leftist movements such as the Popular Front, and populist ones such as former President Moncef Marzouki’s Citizen People Movement, will spearhead the opposition to these measures, as Syriza has done in Greece or Podemos in Spain. The extent of their success remains to be seen. Economic indicators show that the country is in a fragile state, with the looming spectre of a return to authoritarian rule or a second revolution.